Part A reacts with ProCell S3 Part B to form a soft, low density flexible polyurethane foam. The system is designed to have a slow rise, with a cream time of 30-40 seconds, allowing plenty of time for mixing of casts up to 1kg in weight. 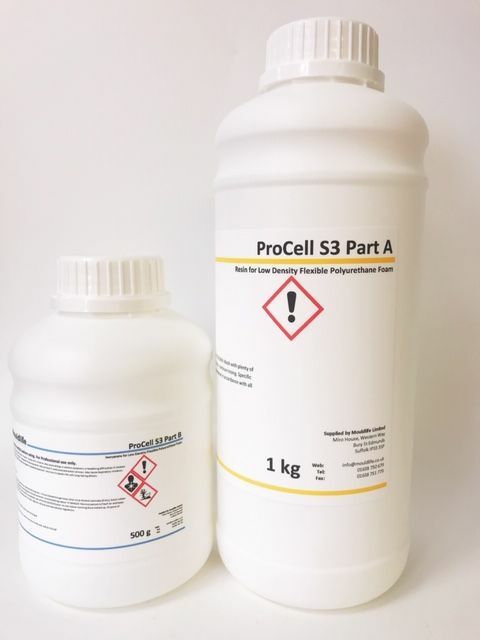 The degree of softness of ProCell S3 can be varied by altering the mix ratio; using this technique, a range of foams can be produced, from a very soft, compliant foam through to a stiffer, more resilient material. This techniques requires some experimentation – please see section 6 for further information. Pro-cell S3 is a registered Trade Marked Product.